Old asphalt pavements are increasingly being recycled into new paving projects as a way to save money, materials, and the environment. In fact, more than 68.3 million tons of reclaimed asphalt pavement, or RAP, and 1.86 million tons of recycled asphalt shingles were put to use during the 2012 construction season in new pavements across the country, saving taxpayers more than $2.2 billion, according to the National Asphalt Pavement Association. Asphalt typically contains a petroleum-based binder mixed with aggregate particles and other additives. When asphalt is reclaimed, the binder in the recycled material is reactivated, reducing the need for virgin asphalt binder. The process also reduces the need for virgin aggregate. But using recycled asphalt in Minnesota entails special challenges because of the cold climate. 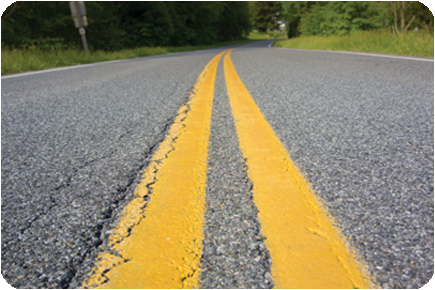 Asphalt binder ages over time due to oxidation, making the glue stiffer and more brittle. As a result, RAP is more brittle and can crack more easily at lower temperatures. “Thermal cracking” is the primary distress in asphalt pavements, not only in Minnesota but in all northern U.S. states and in Canada. Extreme temperature variations that include severe lows, combined with frequent application of deicing salt and repeated freeze-thaw cycles, are the main contributors to distress in our asphalt pavements. As part of a recent MnDOT project studying the performance of high-RAP asphalt mixtures on Minnesota county roads, University of Minnesota researchers performed laboratory testing and analyses on several asphalt mixtures with RAP percentages higher than what is currently allowed in specification to determine cracking resistance at low temperatures. The goal of the project, funded by the Minnesota Local Road Research Board, was to test the boundaries of RAP use and develop better design guidelines for asphalt pavement mixtures prepared with larger than traditional amounts of RAP. Typical RAP levels used for local roadway projects are less than 30 percent. U of M civil engineering professor Mihai Marasteanu, who led this research effort, said the laboratory experiments in general found that asphalt mixtures with a large percentage of RAP were less fracture-resistant than the mixtures with normal levels of RAP or no RAP. The research team used three different test methods at two temperatures on two different grades of asphalt mixture with four levels of RAP (0, 25, 40, and 55 percent). The grade of the asphalt binder is established by the temperature range in which the material performs reasonably well. For example, the binders studied in this project were PG 58-28 and PG 58-34. The latter binder performs well to -34 degrees Celsius, which makes it a higher quality and more expensive option. Results showed that mixtures containing PG 58-28 and no RAP had similar low-temperature performance with mixtures that used PG 58-34 and 25 percent RAP—in other words, using a higher-grade binder makes it possible to use a higher level of RAP. RAP has been used in Minnesota for many years, and small percentages of RAP have no effect on pavement performance. “The challenge is finding solutions to using more RAP—which has so many economic and environmental benefits—in climates like ours that take a significant toll on any type of pavement structure regardless of the construction material used,” Marasteanu explains.